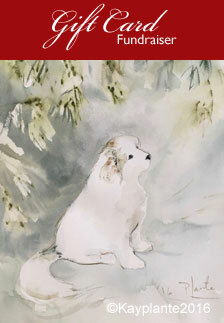 Churchill, now Cody, was adopted on Valentine's Day, 2011. 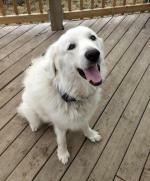 After 5 months languishing at a shelter, he spent only one week with us in foster care before the Rescue Team found him the pyr-fect family. 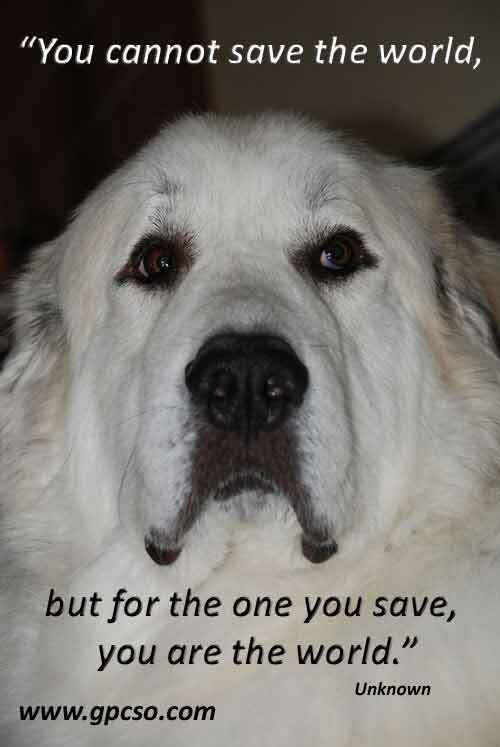 His family was mourning the loss of their beloved pyr, Thor. Cody settled in "like he had always been there". He ignores the many cats and 2 birds at his new home, basking in the love and attention of his new mom and dad. 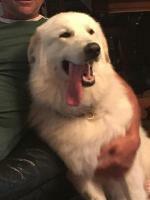 As experienced pyr owners, they know how to train and work with this great big boy. Our Rescue Team is very happy for Cody, and his family... and we are delighted they didn't rename him Cupid! 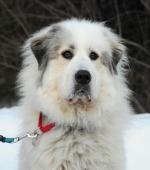 Churchill comes to us from a Humane Society in southern Ontario which asked us for assistance. Although he had done well in a foster situation, when in the shelter, Churchill began to break down, scared and unsure, he just hid in the back of his cage. 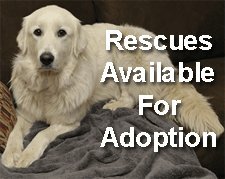 Churchill was found as a stray in a municipality which does not re-home strays. Luckily a nearby humane society offered to take him. He is estimated to be about two years old. He has been neutered, is up to date on his shots and micro-chipped. 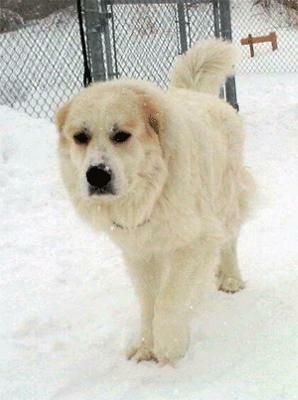 As he was found as a stray, we do absolutely need a fully fenced yard for this lovely big boy. 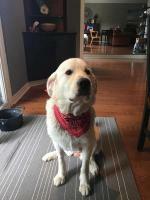 Although we are just learning about this boy, we can tell you that is sweet and loving with his human volunteers at the shelter and in his new foster home. He was unable to be tested around dogs while in the shelter because he was so stressed. However, in his new foster home, he is surrounded by dogs, big and small. He is rather uninterested in the tiny dogs, but is respectful of them. He heads off towards the medium and large dogs to play, although remains respectful of doggie distances and postures, and of the older dogs who are not interested in excited, 2-year-old play. He loves to play. Although described as being shy and skittish at the shelter, he is coming out of his shell and loving life. 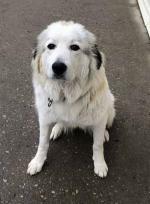 As he is a big boy, and still startles at new sounds and noises, a home with children over ten or so would be best for him. We are guessing he will be okay with cats, as he is good with wee dogs, but as with all new dogs, caution needs to be taken when introducing dogs and cats (and dogs and dogs). He is good with other dogs, although he is mildly food aggressive but that is being worked on. Churchill is waiting for your love and to become part of your pack.